Words very much at the heart and true for our organisation - a charity that was established over 40 years ago to provide a transport service for our community. Off course a lot has changed with time but for us we still deeply value the delivery and purpose of a community service. Our team comes together to plan, progress and deliver transport for our passengers day in day out happy in the knowledge that we are able to contribute within our community. If when you are out you happen to see a yellow or white minibus then it just may be one of our buses transporting members of our community with a duty of care and a passion that comes naturally from providing a service for 40 years. We have a fleet of vehicles that complement our service and offer a range of solutions including Accessible options (ramps, tail-lifts and side steps) depending on your needs - from providing transport to organisations on a regular basis to arranging recreational outings for members of our community, all delivering social value. Our Drivers are trained to recognised standards (MIDAS & PATS) and have the experience to deliver our service to you. If you have any needs not addressed on our site please contact us and we will be very happy to help. BCT's decorated, Festive Bus with driver as santa and helper as elf to share some cheer and happiness with our residents, giving them a chance to go out and see the festive lights on the streets of London. 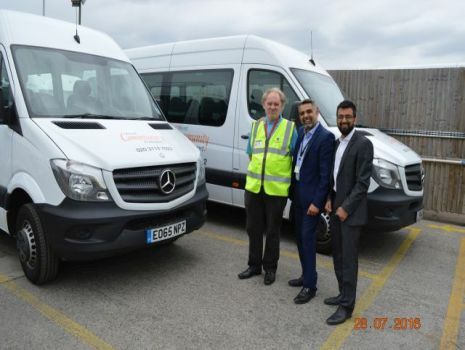 Great news, Brent CT has updated its vehicle fleet with 4 new accessible minibuses ( Rental ). We are driven by the needs of our passengers and have a clear vehicle replacement policy allowing travel to be safe and in comfort. Despite a nationwide shortage of Drivers the recruitment team at Brent CT has worked hard and have managed to attract new staff to add to the brilliant team. More qualified and professional indviduals will be joining the BCT team in January.